Add 2 SuperSpeed USB 3.0 ports with SATA power to your PCI express-enabled PC. The PEXUSB3S24 2-Port PCI Express USB 3.0 card lets you add two USB 3.0 ports to your PCI express-enabled computer system, with an optional SATA power connector to connect to your system power supply and deliver up to 900mA of power per port to USB 3.0 bus-powered devices (500mA for USB 2.0). enhanced with UASP support (USB attached SCSI Protocol), this USB 3.0 controller performs up to 70% faster than conventional USB 3.0 when paired with a UASP supported enclosure (Note: UASP is not supported by all operating systems). using a more efficient Protocol than the traditional USB bot (bulk-only transport), UASP technology optimizes transfers by allowing multiple commands to be processed simultaneously, significantly increasing transfer speeds for less wait time on data transfers. The PCIe USB 3.0 adapter is compliant with USB 3.0 standards for data transfer speeds up to 5 Gbps, while still offering backward compatibility with existing USB 2.0 / 1.1 devices. For added versatility, the controller card is equipped with a standard profile bracket and includes a low-profile/half-height bracket for installation in small form-factor computers. Uasp is supported in Windows 8, 8.1, server 2012 and Linux kernel 2.6.37 or LATER. In testing UASP performed with up to a 70% faster read / 40% faster write speed over traditional USB 3.0 at peak performance. At the same peak in testing, UASP also showed up to an 80% reduction in required processor resources. Test results were obtained using an Intel Ivy Bridge system, Startech.Com add-on USB 3.0 cards, a UASP-enabled Startech.Com enclosure, and a SATA III solid state drive. Works like a dream in my R710 server with Microsoft Hyper-V Server 2012 R2. Didn't need to plug in the SATA power (didn't have one anyway). Installation took less than 2 minutes and it was instantly available to use after booting up the server. I didn't have to install any drivers; it just worked. I went from a 29.5 MB/s sustained transfer rate over USB 2.0 to 80 MB/s sustained transfer with the USB 3.0. Even more importantly it reduced my Windows Image Restore time from 21 hours over USB 2.0 to 4 hours over USB 3.0. At 650 GB in total size the USB 2.0 port allowed me to restore my backup at 8.5 MB/s while the USB 3.0 did the same job at 45 MB/s; more than a 525% increase in performance! I have also been able to use both of the USB 3.0 ports at the same time and have had no issues with the port self-powering the 2.5" external drives. Overall I am very satisfied with this USB 3.0 card and management will be super happy that a full restore of the server will only take 4 hours and not 21. This card is everything I expected a USB3 card to be - easy to install, fast, trouble-free. The last time I upgraded an old PC to USB3 I bought a cheaper card (actually not that much cheaper, and certainly not worth it). 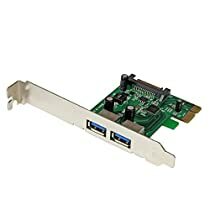 That card has been nothing but trouble, so this time I did some research to find one whose reviews showed few problems with flaky behavior, such as losing the drive in the middle of writing on it, or hanging the whole computer after the drive has been turned off for a while. This card installed easily, and so far I've seen no flaky behavior from it at all. In fact, it installed so easily that I thought it hadn't worked. I put it in the computer, hooked up the power cable, booted up, and there was no indication at all that the card was there, or had installed drivers, or anything. Usually Windows sends notifications about installing drivers, or prompts me for where to find the driver. I had just upgraded to Windows 10, and it just took the card and ran with it. To find out if it was working, I stuck a flash drive in it, and got the sound I usually get for inserting a flash drive. I tried copying files to and from it, and saw 30+ MB/sec write time, and 60+ MB/sec read time - as fast as I've ever seen for that flash drive. Next I backed up my hard drive to a WD MyBook, and got 110MB/sec for the whole backup. 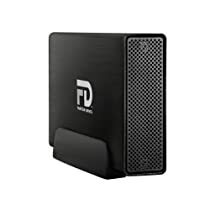 I tried a Toshiba Canvio Connect external drive, and got 75 MB/sec transfers to it - faster than it goes on my laptop, which is about the same speed internally as the desktop but came with its USB3 port built in. Then I tried letting the Toshiba drive power down due to inactivity a few times (it's USB powered), then accessed a file on it to make it run again. It worked flawlessly. My old USB3 card never did well with that - usually hung or lost the drive. This card is well worth its price, and, at least if you have Windows 10, works as though it's just something that came with your machine. Also, this card comes with several power connector options. I carefully ordered the right one, since my machine had only one spare power connector in it, a 4-pin molex. Apparently I didn't need to be so careful, because the card came with an adapter cable to use it with a SATA power connector, and presumably the SATA one comes with an adapter to convert it to a molex. I didn't need the extra cable, but it's nice to know there's at least one company out there that isn't cutting every corner they possibly can to keep their costs down, and would rather make sure their product works the first time. I don't usually give products one star, but there is little choice here. The card locks up the boot process, not even getting to the BIOS boot phase. After three trys, it finally does complete booting. This happened twice where multiple re-boots were necessary. This may be a bad card, but it's not worth my time to try another which I normally do (as most here do not). USB3 add-ons seem to have a problem as I have had problem (not this) with another card. This is running Win7 x64. It appears to be a conflict with existing on-board USB3 ports.